Testimonials Archives - 12th & Oak Floor Co. Please see below for some of our client testimonials. We woudl love to add you to this list of extremely satisfied customers, so contact us today to schedule your free consultation! 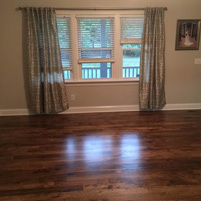 I bought a house and had carpet covering all of the red oak floors. The previous homeowner also had an addition to the house where there was no wood. Izral and his crew came in and removed all the old carpet and installed new red oak in the kitchen and family weaving the new wood into the old wood. 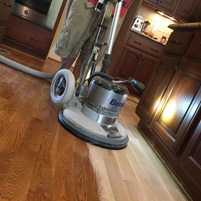 We also had 12th & Oak sand and finish the old as well as the new and stain the hardwood. I couldn’t have asked for a better company to work with. You can’t even tell where the old wood and the new wood meet. There was no dust which was very surprising. It has now been almost 5 years since 12th & Oak completed this work and the floors look just as good today as they did the day they finished. I have highly recommended Izral and 12th & Oak to all of my friends and family. Kitchen wood floor was subjected to water to dishwasher leak. Izral, provided lowest cost repair quote. Expert knowledge and use of the latest who is all out of the dust free repair. The repair section cannot be different with different jaded from the rest of the floor. Great customer interface, on-time arrival, and most importantly taking ownership of the repair of the main reasons for giving them the highest rating. Outstanding! Will recommend him highly to neighbors and hire him again for future projects. This company is the best I could recommend. They took the time to do professional work in a timely manner. They work with me while still living in the home. No questions they cannot answer. They also made sure to clean up and dust was to a very minimum. Izral and his crew are the best! My mover had gouged 3 boards in my floor, right in the middle of the room. I had Izral come out and replace the boards (at the movers expense). Great, professional job and I have a difficult time today identifying these three boards even after two years. I have recommended him to several others and they are all very pleased with the results. I had laminate installed back in 2012. My floor still look amazing. The quality of work that was performed, a long side the professionalism, you will not be disappointed.